In Riyadh, on the first stop of his tri-monotheism tour that will take him to Jerusalem and Rome (sorry, Mecca was not available), Donald Trump gave a major speech on a wide range of topics – the Middle East, jihadi violence, Iran, an "Arab NATO," and Islam. It's a mixed performance, but overall positive. First, what's wrong with the 34-minute speech: It's incoherent, jumping from topic to topic and then back again. It's neither eloquent nor insightful (as in, "Terrorists do not worship God, they worship death"). In places, it consists of Obama-like euphemisms, such as the statement that history's great test stands before us, one goal that transcends every other consideration: "to conquer extremism and vanquish the forces of terrorism." And it's farcical to announce the opening in Riyadh, the headquarters of Wahhabism, of a "Global Center for Combating Extremist Ideology." I bristled at Trump calling Saudi Arabia "sacred land." I gagged on the warm praise for King Salman, someone implicated in contributing tens of millions of U.S. dollars during the 1990s to finance jihadi violence in Bosnia and Pakistan. The context of the speech is acutely worrisome: U.S.-Saudi agreements totaling over $380 billion grants a tyrannical regime added influence over Americans. The $110 billion Saudi purchase of U.S. arms makes a vast arsenal available to a government whose goals differ profoundly from those of most Americans. 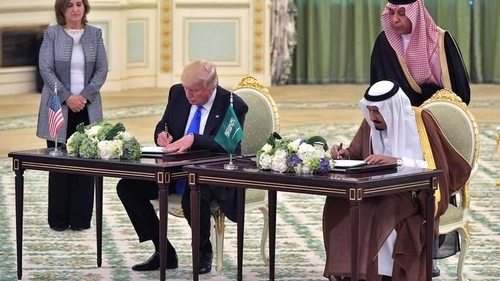 Donald Trump signs huge agreements with the Saudi government. These not inconsiderable reservations aside, it's a good speech that signals a major shift in the right direction from the Obama years, particularly concerning Iran and Islam. Most important is Trump's willingness to point to the ideology of Islamism as the enemy. This matters exceedingly: just as a physician must first identify a medical problem before treating it, so a strategist must identify the enemy before defeating it. To talk about "evil doers," "terrorists," and "violent extremists" is to miss the enemy's Islamic core. It was unprecedented and noteworthy for an American leader to declare this not just in the capital of the Kingdom of Saudi Arabia but also at the Saudi-conjured "Arab Islamic American Summit" with leaders from some 50 Muslim-majority countries present. "I have your number," Trump effectively announced. "So, don't play games with me." The guest list for the "Arab Islamic American Summit." He confirmed this point several times in the speech: "Muslim-majority countries must take the lead in combatting radicalization"; "Muslim nations must be willing to take on the burden, if we are going to defeat terrorism and send its wicked ideology into oblivion"; a mention of the human toll of "ISIS, Al-Qaeda, Hezbollah, Hamas, and so many others"; and his call to stand together "against the murder of innocent Muslims, the oppression of women, the persecution of Jews, and the slaughter of Christians." No fuzziness here about the nature of the problem. 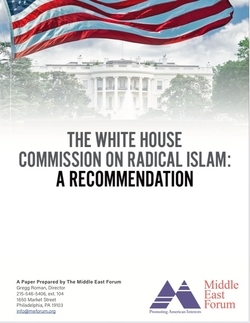 MEF's proposal for a White House Commission on Radical Islam. But one statement does not a policy make. George W. Bush and Barack Obama spoke on occasion about, respectively, "Islamofascism" and "Islamists." Obama even spoke of "jihadists." However, these explicit terms had no real bearing on their policies. Similarly, British prime ministers Tony Blair and David Cameron gave wondrously good speeches about Islamism, but these had even less impact on their government's actions. For Trump's speech to make a difference, it must be the start of a consistent approach to recognizing that Islamist ideology stands at the heart of the conflict – and that violence is only one of its manifestations, and perhaps not the most dangerous of them. A good way to start would be to recall Trump's speech as a candidate last August, when he pledged that "one of my first acts as president will be to establish a commission on radical Islam ... to identify and explain to the American public the core convictions and beliefs of radical Islam, to identify the warning signs of radicalization, and to expose the networks in our society that support radicalization." The commission will "develop new protocols for local police officers, federal investigators, and immigration screeners." Let's go, Mr. President – it's time to appoint a White House Commission on Radical Islam.